Unlike the vast majority of celebs at Sunday’s Golden Globes, our favorite social, Serena, isn’t afraid of a statement necklace. On last night’s episode of Gossip Girl, she topped off her outfit with a gorgeous piece from Gemma Redux. The Liz necklace is from the spring line, but if you put an order in before next Monday, designer Rachel Dooley will make it for you now. Because every true fashionista wants to be first. 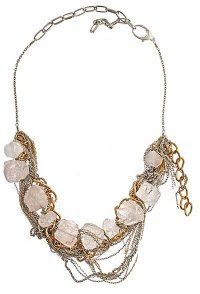 To order the $424 necklace, email: sales@gemmaredux.com with the subject line: Spring Preview Liz Necklace. For those who prefer Blair’s preppy style–that blouse she had on last night is from Milly. And it’s still available–on sale–in black at Bloomies in a size 4.